I'm going to be having a surprise (I hope) anniversary party for my parents in Nov. I'm using SEI's Field Notes line for the save the dates, invites, album and decorations. I've been pretty gaga about the line since I first saw it and the rich colors are perfect for this type of occasion. 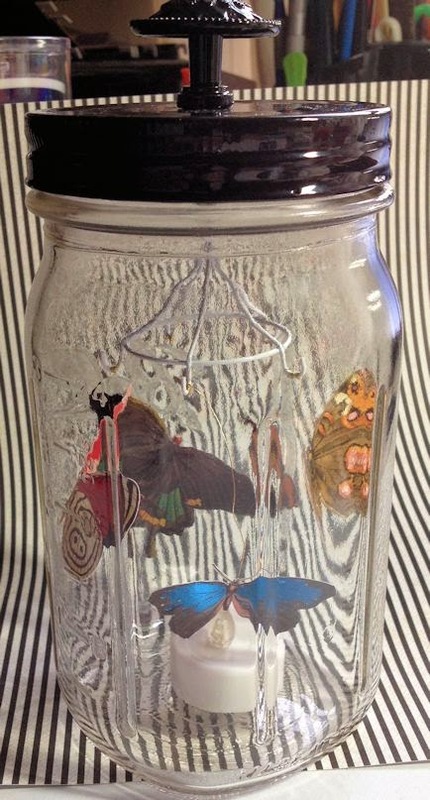 I saw the mason jar mobiles that Cosmo Cricket makes and thought they'd work well with butterflies so I'm making butterfly jars for the tables. I'm still working out the details but right now, this is where they stand. As you can see (though not lit very well), I'm going to put a small electric tea light in the bottom of each. I imagine the room will be a smidge dim- fancy schmancy kind of restaurant and all- so the lights will show up a bit better. I'm hoping to find some yellowish lights rather than the LED blue that's in this one. I was planning to put the candles in votive holders to dress them up a bit but they just took up too much real estate so I may make small paper wrappers for them out of more of the Field Notes paper. LESSology: Butterflies. The mason jar has been with me for YEARS and probably contained pickles or something else I canned once upon a time. Oh my! LOVE how these turned out...hope the surprise works out well! WOW!!! Thanks so much for playing along with LESSology! !